My name is Patricia Bragg. This movie is the struggle of a people, desperately battling to keep their way of life , their lands, and their families and homes intact. 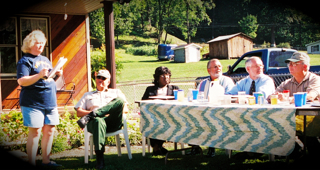 A group of citizens battle to change a mind set that has remained in Appalachia for many years. “One simply does not fight the coal mining company. These companies are powerful ientities with finances, machinery, and backing of our government; but fight back we did! We educated our people, one by one, family by family, and also educated the very people that were supposed to be protecting the public, on the policies governing us. Our efforts were huge, enormous and often overwhelming. Seeing the light coming out of the once defeated eyes of our people were enough motivation to continue on. Along the way, we made friends, lost some; laws changed for the betterment of coalfield citizens and built strong relationships with government offices we had feared to enter before. We were on a mission! A mission to be heard! Little by little, people began to recognize us by our reputation. A grassroots group that was strong, determined, prepared with faith and the knowledge of the laws to protect us. Everyone said, “They accomplished the impossible: a government bill passed, coal companies to the table, enforced regulations, drilled water wells, etc, etc….” Just a group of ordinary people with a common goal did the impossible. This movie is what America is built on. In God, we trusted, and we again held the powers that be to the constitutional scale of justice. Made by the people, for the people and not for special interest groups; this government is ours. We became hope to our communities as well as others. The movement, we began still continues everyday when an individual says, “Enough, this has got to change.” Nothing will happen until one person steps up and others step out so all can walk as one to achieve the impossible, change. Trish Bragg, standing talks to DEP officials in 1998. From right, John Ailes, mining director; Mike Castle, DEP director; unknown; Pam Nixon, environmental advocate; Joe Parker, chief inspector.